Attached to the target board as a socket to mount a QFP IC, or as a connector an emulator. Top Cover for IC Package. Used when placing QFP packages onto NQPACK. Used to connect the emulator to NQPACK to retrieve signals from NQPACK. Used to adjust the height between the target board and emulator cable or board. * Once this product is out of stock, it will be replaced with the pin number indication type. By simplifying the tightening of screws at the four corners of the socket, the complex mounting procedures are eliminated. Can be inserted with the LOCK COVER mounted. Indication of pin numbers facilitates to find pins. Emulator cable or PWB can be connected to YQPACK with YQSOCKET. Height can be adjusted by attaching YQSOCKET to the emulator cable or board. Surface mounted devices (under 2mm) can be mounted around patterns. These products are in compliance with RoHS which are very safe for environment. 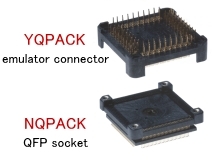 NQPACK, HQPACK and YQPACK are the emulation Sockets. IC package should not be placed between NQPACK and YQPACK. * Please use the sockets for test applications only. * Only the name of articles rule. Please inquire whether the product has developed. * Sockets should be selected based on lead length. The most suitable socket may vary among QFP packages with identical pin count, lead pitch and IC body size. Make sure you select the appropriate socket by referring to "Products Ranges & Technical Drawings." 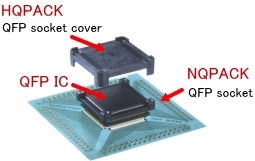 * The supported IC size for NQPACK256SE296 is 30.0 x 30.0mm. Note that the product name/number does not indicate the actual IC size. 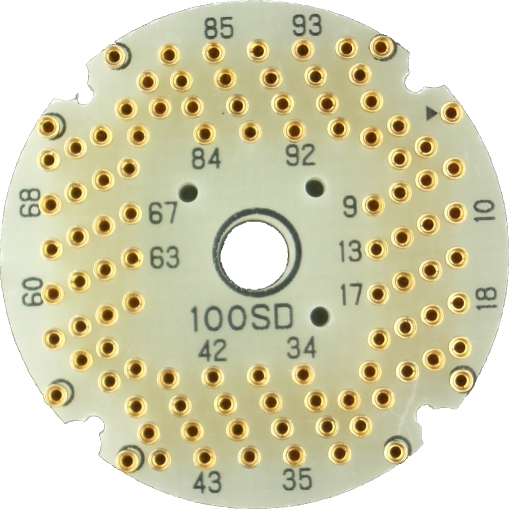 * The supported IC size for HQPACK100RB1622 is 16.0 x 22.0mm. Note that "1622" in the product name/number indicates the length of both sides of the IC, not the length of the short side. By simplifying the tightening of screws at the four corners of the socket for QFP IC, the complex mounting procedures are eliminated. Poor contacts caused by uneven tightening of screws are reduced. Can be used for emulators and conversion boards. *1 This product cannot be used with HQPACK144SD226-H.
*2 This product cannot be used with HQPACK208SD306H. *3 This product cannot be used with HQPACK240SD-H.